Vaclav Havel, the playwright, essayist, dissident and politician, died in the night on Sunday, reportedly in his sleep, and tended to by his wife Dagmar, reports Radio Prague. In another article, Radio Prague describes Havel’s career as a playwright – despite having been barred from formal college humanities education by the Communist regime -, and as a dissident. In the 1990s, he served as Czechoslovakia’s last, and as the Czech Republic’s first president. 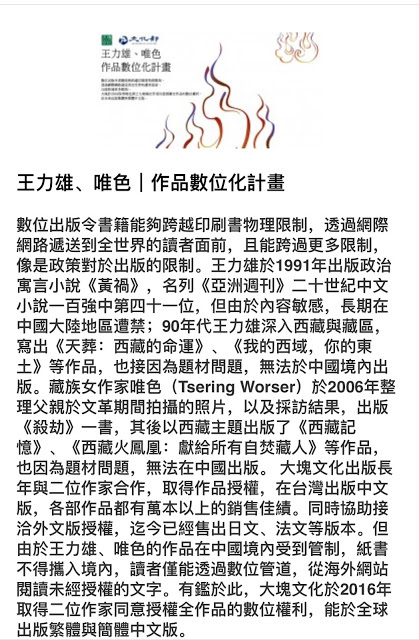 Chinese media are only slowly reacting, possibly given the time of day when news about Havel’s death broke, but IFeng (Phoenix, Hong Kong) provides a historical photo timeline, and 163.com republished IFeng’s piece, also today. (As is custom in Chinese, his age is stated as 76 there, counting his day of birth as his first birthday.) There was nothing to be found online on Xinhua Net in Chinese by 15:30 GMT , but Xinhua’s English outlet carries a short news article. Another short note was available on CNTV, but has apparently since been removed or relocated. China’s media didn’t seem to have a pre-prepared obituary in store for Havel – and to describe his life is probably a challenge in China. Not only was Havel a dissident – he kept practicing solidarity with dissidents elsewhere, after Czechoslovakia became a free society. In his last public appearance, early last week, he met with the Dalai Lama, who reportedly asked him to live at least another ten years. I’m deeply saddened to learn about Mr. Havel’s passing. I’m Tibetan, an independent author, and have always seen Mr. Havel as a spiritual guide, feeling uplifted from reading his works. As a Tibetan, I’m deeply grateful for Mr. Havel’s attention for the Tibetan issue and Tibet’s predicament. 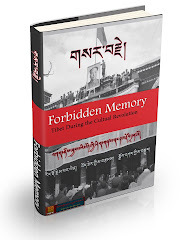 I remember him saying that only after visiting Tibet and Taiwan, he would visit Beijing. This meaningful line is something we won’t forget. Eight days ago, on “World Human Rights Day”, His Holiness, the Dalai Lama, arrived in the Czech Republic, on Havel’s invitation. 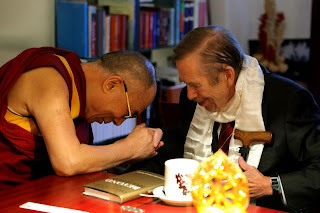 I saw several photos of His Holiness and Mr. Havel on the internet, and I felt deeply moved. Following Tibetan tradition, I have lighted a memorial candle for Mr. Havel, in front of my household’s Buddhist shrine, and I sincerely pray that he will be born again – this world needs him! One legacy of that original “correct” understanding is a third peculiarity that makes our systems different from other modern dictatorships: it commands an incomparably more precise, logically structured, generally comprehensible and, in essence, extremely flexible ideology that, in its elaborateness and completeness, is almost a secularized religion. [...] To wandering humankind it offers an immediately available home: all one has to do is accept it, and suddenly everything becomes clear once more, life takes on new meaning, and all mysteries, unanswered questions, anxiety, and loneliness vanish. Of course, one pays dearly for this low-rent home: the price is abdication of one’ s own reason, conscience, and responsibility, for an essential aspect of this ideology is the consignment of reason and conscience to a higher authority. I read this when I was a teenager, and it came to my mind right away when I heard of Vaclav Havel’s death, earlier today. I don’t feel in a position to juge if he was one of “Europe’s great thinkers”, but it doesn’t matter to me anyway. Reading his essay had a profound impact on me. Havel discussed what we might call “abstract” issues in a way even an adolescent like me, lucky enough to live west of the iron curtain back then, would bear in mind, and gradually understand, almost without re-reading.